Want to feel like a million dollars? 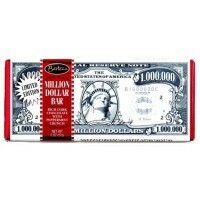 Try the rich, decadent Million Dollar Chocolate Bar with Peppermint Crunch from Barton’s. This luscious, dark chocolate, American treat is fun for kids, yet sophisticated enough to satisfy even grown-up taste buds. 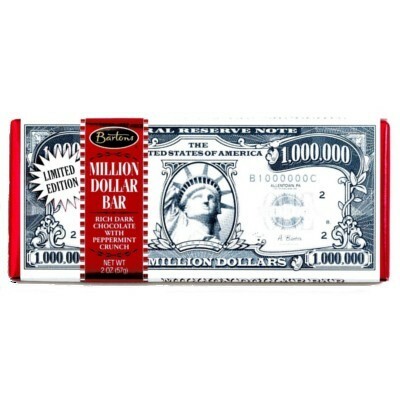 So, whether you want to give someone a “million dollars” or enjoy it for yourself, this mouthwatering Million Dollar Bar will make anyone feel rich. Dark chocolate (sugar, chocolate liquor processed with alkali, cocoa butter, milk fat, emulsifier E322 [soy lecithin], vanilla), sugar, corn syrup, peppermint oil, colors E129*-E127. Manufactured in a facility that also processes tree nuts, peanuts, wheat and egg. *May have an adverse effect on activity and attention in children. Contains GMO. Nutrition facts (for 100g): calories 491Kcal, total fat 31.6g (saturated fat 19.3g), total carbohydrate 61.4g (sugar 49.1g), protein 3.5g, salt 0g.